Lucideon CICS Limited is pleased to announce that it is celebrating 30 years of providing independent verification and certification services to its clients. As an international sustainability assurance provider, Lucideon CICS' services are provided to clients all over the world. Their verification services include verification of greenhouse gas or carbon emissions for both voluntary and mandatory reporting schemes including EU ETS (EU Emissions Trading Scheme). Certification services include management system certifications to standards such as ISO 50001 and 14001. Since its inception in 1985, Lucideon CICS has invested significantly in both people and capabilities. Most recently, CICS has appointed both Tony Summers as GHG Lead Auditor to strengthen the verification team and Jonathan Green as Management Systems Auditor to strengthen the certification aspect of the business. Shaun Bainbridge, Director, Assurance, Lucideon, said: "We are thrilled to be celebrating our 30th anniversary in 2015, an achievement which I feel highlights the vast experience our team of expert auditors and verifiers has developed. "During this time we have built up a varied client base which now exceeds 1000 contacts with locations across 30 countries and to date we have verified over £7 billion of carbon dioxide emissions. 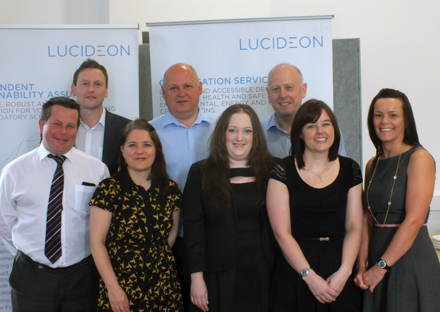 The key to our success is our personal approach to dotting the 'I's and crossing the 'T's and this can be seen in our new-look website, www.lucideon.com/assurance." Shaun Bainbridge, Director, Tony Summers, GHG Lead Auditor, Juliet James, Business Support Manager, Tim Watts, Operations Manager, Ann-Marie Cornall, Sales Consultant, David Robinson, Assurance Services Manager, Michelle Simons, Business Support & Accounts Administrator and Jemma Weaver, Business Support Assistant. Jonathan Green, David Wright & Chris Cooper, Management Systems Auditors.